RiPPED was conceived and brought to fruition in 1998 with their first demo 'Emotions' that attracted their new manager Gerry Young of Current Records & Management (Parachute Club, Martha & the Muffins). 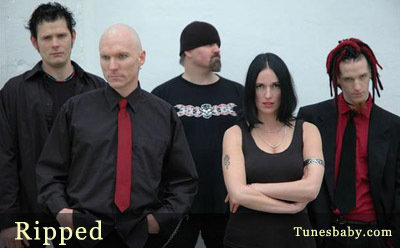 With the guidance of an experienced veteran of the international music scene on their side and a strong repertoire of new rock/pop music, Ripped secured their first record deal with Sextant Records / EMI Distibution in early 2002. Leap ahead to 2004, RiPPED hook up with producer Ashton Price of Morph Productions (Kazzer, Sony Publishing) to embark on their greatest adventure. This was the beginning of 'Blow Your Mind' , the sophomore release of RiPPED. Once again, Sextant Records is hot to grab the new sounds and signs them to a second record. The sound has changed for RiPPED ....they bring more harmonies, bigger guitars, new melodies, and special effects that are inspired and compared to Garbage, Evanescence & No Doubt. They have now attracted big time producers to finish the mixing and give them that big radio sound. Dave 'Rave' Ogilvie ( Nine Inch Nails, Marilyn Manson, David Bowie, Skinny Puppy) and Dan Brodbeck (The Salads, Jersey, Delores O'Riodan) did the mixing for the singles 'Show Me' , 'Anodyne' & 'A Daily Ritual' . These songs are now ready for the New rock & Hit Radio of 2005. A special bonus on the new album is the band's cover of the classic 'Call Me' by Blondie.... they have taken the song and made it their own... creating a hard rock, gothic version that has people talking and saying this is the next break through cover/remake of 2005. It is a real treat to hear the sultry vocals of Sandi, cutting guitars of Moody, rythmic bass of Attila and Mind Blowing production of Ashton Price in this must hear rendition of one of the great New Wave songs of the 80's.... RAWK ON BABY! !